Dr. Frank Kleinsorge is a native of Pennsylvania, born and raised in Bethlehem, PA. He went to Fredom High School, Kutztown State University and New England College of Optometry in Boston. He has been in practice since 1991. A U.S. Veteran, he served for three years as an Officer in the U.S. Air Force during the Gulf War. His experience as an optometrist during his time in service has provided valuable experience particularly in emergency eye care. Currently he resides in Tannersville, PA (Poconos) with his wife, Arlene. He is very active in the community and church. They have five children and nine grandchildren. In addition to his busy practice, Dr. Kleinsorge is an sports and outdoor enthusiast. Kleinsorge Family Eye Care is a local family business with a caring staff serving the Stroudsburg area. Their mission is to provide quality medical and vision eye care for you and your family. 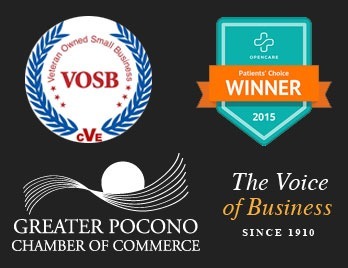 Kleinsorge Family Eye Care has been recognized as a top Stroudsburg Optometry practice in 2015.